2015 NFL Contract Year Stars: Who Can Carry Your Fantasy Team? There has been a lot of talk about contracts this offseason. Between Dez Bryant threatening to hold out and more recently, Eli Manning making his pitch for a new contract, players have been vocal. This can help fantasy football managers by targeting players looking to get a lucrative new deal. These are big time players, so the numbers are not surprise. Aside from Demaryius Thomas, the contract year stats show a marked improvement over the previous season, however. While this is not always going to be the case, it is one more criteria to use when looking for an edge in your fantasy football draft. So which players this year can be looked at for some walk-year goodness? In case there was not enough buzz already surrounding the quarterback for the G-Men, here is one more reason he could be a bargain. In Manning's last contract year (2009) he threw for 4021 yards with 27 touchdowns and 14 interceptions. This was easily his best season to date at that time. Now Eli has fleshed out his resume a bit and the Giants have picked up one of the best young receivers in the league in Odell Beckham Jr.. This should lead to Manning putting up the big stats needed to justify one more big contract. Could this guy be your fantasy QB? Only if he can stay on the field. 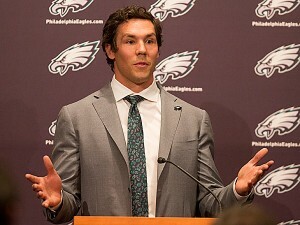 Bradford is already a hot sleeper candidate this year as he enters Chip Kelly's high powered offensive machine. This offense made viable quarterbacks out of such stalwarts as Nick Foles and Mark Sanchez, so hopes are high for Sam Bradford. This is a dicey proposition as Bradford has the talent to justify a big payday, but never stays healthy. Both times that Bradford has played in 16 games he has completed around 60% of his passes and thrown for over 35oo yards. This is impressive on a Rams team that has not been known for offense since the departures of Marshall Faulk and Torrey Holt. In the end, drafting Bradford is a huge risk, but it could pay big dividends for those intrepid enough to give him a shot. Other Contract Year QBs: Nick Foles, Kirk Cousins-Could Cousins End Up Being Valuable? Although not one of the elite running backs in fantasy football, Miller probably gets less respect than deserved. He has improved significantly each year in the league and that trend should continue in 2015. Last year, the Dolphins offense increased their yardage output by 12% over the previous season. This was largely due to the play of Ryan Tannehill (4045 pass yards 27 td 12 int) and an improving Lamar Miller (1374 total yards 9 total touchdowns). The Dolphins offense should be explosive in 2015 and a breakout reminiscent of Demarco Murray, but not to quite the same historic level. An all-purpose beast for the past seven seasons, production from Forte won't come as a surprise. Still, the added incentive of another payday for an aging running back could make for a nice stat bump. Forte was injured in the season before he signed his last contract, but he managed almost 1000 yards despite missing 3 1/2 games. The losses of Brandon Marshall and possibly Kevin White should make the Bears rely on Forte a bit more this season, but it may also allow defenses to stack the box. Given the extenuating circumstances, it is probably best to just draft Forte as you normally would rather than giving him the contract year bump. Speaking of Bears playing for a contract, Jeffery is going to be looking for a fat check next season as well. This season he will be on the last year of his rookie deal, which pays just over $1 million per year. This is quite a bargain considering the elite production being provided by Jeffery. This year, he will be asked to step up and be the number one option in the receiving game; a responsibility that quarterback Jay Cutler thinks Jeffery can handle. The volume will certainly be there and 2015 should see Alshon getting over 100 catches while setting a new career mark for yards. Jones should see his share of the end zone in 2015. Get in on this bargain. Jones is a risky player coming off an injury that caused him to miss the entire 2014 season, but he can likely be had for a very low price on draft day. Missing a season should just be more incentive for him to prove to teams what he can do for their receiving corps. Before his injury, Jones was a popular breakout candidate following a solid 2013 season. That season saw Jones put up 593 yards and 9 touchdowns from week 6 through the end of the season. I may be in the minority on this one, but I see big things coming for Marvin Jones in 2015. The Colts almost had two players on this list, but T.Y. Hilton signed a 5 year $65 million deal recently. This leaves Dwayne Allen out in the cold and potentially looking for a new team soon as the Colts prepare for a future Andrew Luck deal. Don't cry for Dwayne though, he is going to put up big numbers this year and that should leave him with plenty of suitors. Last season, Allen was bitten by the injury bug. When he was healthy in weeks 1-9 however, Allen scored 7 touchdowns. Coming into 2015 healthy, those scoring chances should abound again and Dwayne Allen will provide solid value at a paper thin position. It seems like Green has been a hot breakout candidate for about 15 years now. In reality he is only 25 years old and this season he should get a real chance to prove himself with Antonio Gates suspended for the first four games. Although Gates is an all-time great and playing for a contract himself, I think that green gets out to a fast start. This connection that could develop with Philip Rivers may be enough to finally generate those extra looks that have been talked about for the past couple of seasons. As much as I hate to say it though, you may want to draft Gates as a handcuff for one more year. A lot of the really big names were taken away from this list with contracts earlier in the offseason, but there is still big potential here. It will probably not be huge stat bonanza that last year's contract players were, but bargains are available as a result. Play your cards right and you could still find yourself cashing on a player who is looking to do the same. Category - Fantasy Football News and Analysis - 2015 NFL Contract Year Stars: Who Can Carry Your Fantasy Team?